Hillsboro MB Church, built in 1893. Source: R. D. Thiessen (May 2014). 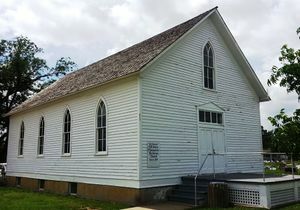 Hillsboro Mennonite Brethren Church in Hillsboro, Marion County, Kansas was organized on 25 April 1881 near Hillsboro with 34 charter members as the "Johannestal Church of French Creek." The congregation met in rural homes until 1882, when a school building was purchased in Hillsboro. The first church, built in 1893, was replaced by a larger church in 1910, which was remodeled and enlarged in 1926 to a seating capacity of 700, with a large Sunday-school building 145 x 40 ft., and an increase of auditorium space of 300 seats. The ancestral background of the membership is mostly Dutch coming from Russia and Poland in 1874-1884. 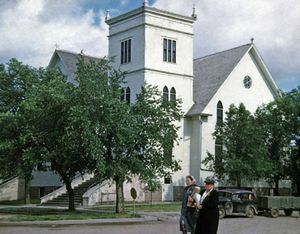 One third of the congregation in 1954 was rural and two thirds urban in a town of 2,000. Originally the Low German dialect was used in homes and German in services, but in the middle of the twentieth century both homes and services changed to the English language. The older people's Sunday school classes still used German in 1954, and occasionally it was used in services. Pastors serving the church were John Harms, John F. Harms, P. P. Rempel, P. E. Nickel, J. W. Vogt, and Waldo D. Hiebert. In 1954, the congregation had two young people's organizations, two women's organizations, church choir, two male choruses, a Sunday school, and a Bible school for the entire congregation meeting on Wednesday. The church practiced feetwashing, had an electronic organ, and several pianos. In 1954 the congregation had a baptized membership of 827, and was a member of the Southern District. In 1959 a sanctuary that seated 800 on the main floor was dedicated. It was this building that was a church home to many until 7 March 2004, when a fire destroyed the building. During the next three years the church used the local school for its Sunday School and worship services. Wednesday night classes and other events were held in other churches of Hillsboro and Tabor College. In June 2007 the congregation entered its new facility in Prairie Pointe, a development on the east side of Hillsboro. Hiebert, Waldo H. and Richard D. Thiessen. "Hillsboro Mennonite Brethren Church (Hillsboro, Kansas, USA)." Global Anabaptist Mennonite Encyclopedia Online. March 2014. Web. 23 Apr 2019. http://gameo.org/index.php?title=Hillsboro_Mennonite_Brethren_Church_(Hillsboro,_Kansas,_USA)&oldid=122813. Hiebert, Waldo H. and Richard D. Thiessen. (March 2014). Hillsboro Mennonite Brethren Church (Hillsboro, Kansas, USA). Global Anabaptist Mennonite Encyclopedia Online. Retrieved 23 April 2019, from http://gameo.org/index.php?title=Hillsboro_Mennonite_Brethren_Church_(Hillsboro,_Kansas,_USA)&oldid=122813. Adapted by permission of Herald Press, Harrisonburg, Virginia, from Mennonite Encyclopedia, Vol. 2, pp. 742-743. All rights reserved. This page was last modified on 4 June 2014, at 06:31.